Mid-tier IT firm Mindtree posted a healthy growth in net profit for the last quarter of FY2014. Mid-tier IT firm Mindtree today posted a healthy 24.5 per cent growth in net profit to Rs 98.2 crore for the last quarter of FY2014 and expressed confidence that it would beat Nasscom’s industry growth forecast for this fiscal on the back of strong deal pipeline. The Bangalore-based firm saw profits growing to Rs 98.2 crore in the reported quarter from Rs 78.9 crore in the January-March 2013 period on the back of strong revenue growth, increase in IP based licensing revenue and enhanced operational metrics. Its consolidated revenue grew by 34.5 per cent to Rs 823.7 crore in Q4 FY2014 from Rs 612.4 crore in the year-ago fiscal. “We signed several multi-million multi-year deals. IN Q4, we signed orders worth USD 133 million. In FY’15, we see a stronger pipeline, we expect growth momentum of the quarter into Q1. It will be a good start to the year,” Mindtree CEO and Managing Director K Natarajan told reporters on a concall. He added that the company will beat IT-BPO industry body, Nasscom’s revenue growth guidance of 13-15 per cent for 2014-15. In US dollar terms, net profit was up 8.9 per cent at USD 15.9 million, while revenue was up 17.4 per cent at USD 132.8 million. For the year, net profit rose by 19.3 per cent to USD 74.6 million in the last fiscal, while revenue grew 15.1 per cent to USD 501.5 million during the same period. “FY 2014 has been a momentous year for Mindtree. We crossed half a billion dollars in revenue, USD 100 million in operating profits and Rs 100 of earnings per share,” he said. In rupee terms, net profit grew 32.9 per cent to Rs 450.8 crore, whereas, revenue rose by 28.4 per cent to Rs 3,031.6 crore in FY2014. Natarajan said the company has progressed well in its journey to increase its strategic relevance to clients and will continue to aspire, to deliver superior financial performance, innovation and industry leadership in chosen verticals, among others. The company’s board has recommended an interim dividend of 50 per cent (Rs 5 per equity share of par value Rs 10 each) for the quarter ended March 31, 2014. It has also recommended a final dividend of 50 per cent for FY2014 and a special dividend of 50 per cent for completion of 15 years in business as well as a 1:1 bonus share issue. 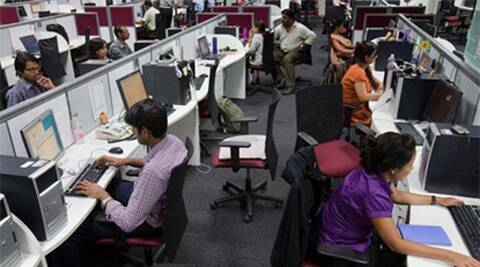 During the January-March quarter, Mindtree’s USD 5 million clients grew to 24 and USD 1 million clients rose to 73. Its total clients base stood at 207 as of March 31, 2014. The company added 397 employees (gross) during the fourth quarter taking its total headcount to 12,926 employees as of March 31, 2014. Its attrition rate stood at 12.7 per cent on LTM basis. Mindtree expects its capex for FY’15 to be USD 45-50 million, a major portion of which will go into the company’s new facility at Bhuwaneshwar. During Q4, the company saw its CPG, retail and manufacturing vertical segment growing 7.2 per cent and hi-tech by 6.1 per cent. Shares of the company today closed at Rs 1,380.65 apiece, down 1.38 per cent from its previous close on the BSE.